Oracle.com , Website Oracle Corporation , ( an American multinational computer technology corporation that specializes in developing and marketing computer hardware systems and enterprise software products – particularly database management systems ) homepage showing just "HELLO WORLD" text on page. I tried to open it via mobile, it redirect me to mobile version at Oracle.mobi, Yes its working fine as normal. Then we start moving on Twitter to find out whats going on, Lots of people tweeting about this and everyone seems to be confused that IS IT A HACK ? or the site is Under Maintenance ? Okay, Next I move to ORACLE twitter accounts @Oracle @OracleDatabase to find out either they have tweeted about this Strange update or not , But there was no tweet from their side from last 12 Hours. Most of the people are tweeting that, Oracle may loose their all web server content, so they put a temporary page. But then sudden I got another tweet from one of my follower that, some internal pages of Oracle are working fine and Yes that's working fine, I confirm. Click here to see the LINK, that means, Only homepage or a few more pages affected . Possibility that, may be they are updating Homepage with a new Design ? Someone is tweeting that : "A "Hello World" program has become the traditional first program that many people learn." Then I check out the date, its 12-13 Oct.. then "Dennis Ritchie" come in my mind that Father of C/UNIX was died on 12th Oct 2011 , Is this small "Hello world" Program was a Tribute to him ? Well, now when I reach to the end of the article, another tweet come in reply that, "Website is now working Fine". 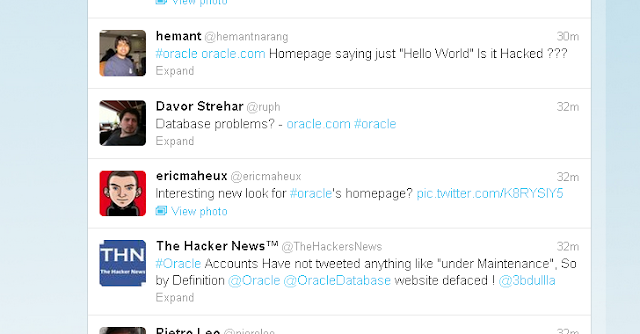 So lets stop guessing :P , Only Oracle itself can declare the truth. Wait for Next update.